Google has a done a great job in training us that if we don’t see the results we want on the first page that we were the ones that were wrong. Face it, when you don’t find the result you want fast, what do you do, you change your search terms. Here’s a couple tricks for taking your search game to the next level. Have you ever performed a search for more than one word and seen the results were really dominated by one of the words but not the full phrase? Wrap the phrase in quotation marks. 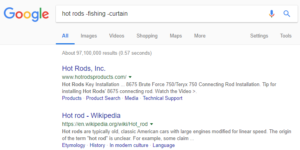 Now the Google search will look for results that include all of the words in the phrase. If you have ever searched for a word but have seen your results taken over by results for another phrase that includes one of the words you are looking for, you know that can be annoying. To eliminate words from search results simply use the minus symbol before them. 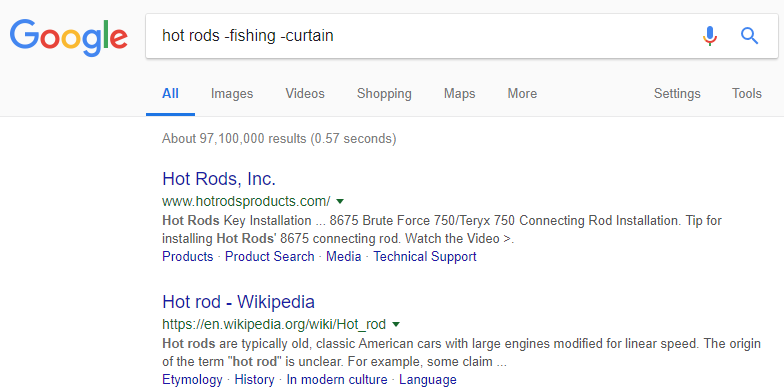 That way you can eliminate all fishing rods and curtain rods from your search for hot rods. Sometimes you know where you want to see the answer from but you just don’t know where it is there and you don’t want to waste a couple steps to go to the site first and search there. Simply search for site:twitter.com MS Digital Solutions to find the URL for MS Digital Solutions on Twitter. The principles of KISS – Keep It Simple Stupid apply. As mobile search has grown in popularity and the Android operating system is powering may of the phones and home devices out there, Google now supports voice based search. It also has special search results for simple functions like math, definitions. Contextual searches likely “Near Me” will likely give you a set of results with a map. So just search in as natural a manner as possible.